You only see other people’s portfolios and not your own. Search the title, description, tags and owner of a portfolio. 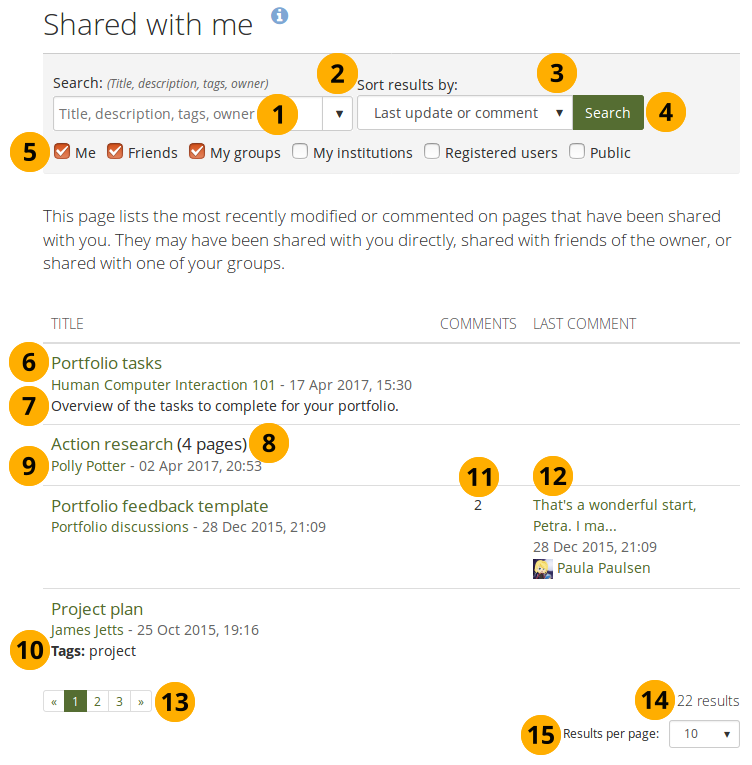 Show results of portfolios that have been shared with you directly, as a friend or a member of a group. In den erweiterten Einstellungen können Sie diese Optionen anpassen. Shared with me is a place where you can find the portfolios that you may be most interested in. Sie können in dieser Ansicht nichts hinzufügen oder löschen. Sie haben nur Lesezugriff. Search: Type your search term into the search field. Per default, you search by title, description, tags and the owner of a portfolio. Use the drop-down arrow to limit your search to tags only. Click the Search button to perform your search. Öffentlich: Sie sehen diese Option nur wenn der Site-/Administrator öffentliche Ansichten zugelassen hat. The title links directly to the portfolio. Die Beschreibung der Ansicht wird angezeigt wenn der Autor eine erstellt hat. When a collection is part of the search result, you see how many pages are contained within it. The author link takes you to the author’s profile page or in the case of a group to the group’s homepage. The date displays the last time the portfolio was updated. Tags that are associated with the portfolio are displayed. You see the number of comments. The beginning of the latest comment as well as its author and the date when the comment was left are displayed. By clicking on the comment, you can read it in its entirety. Nutzen Sie den Seitenwechlser, um Ergebnisse anzusehen, die auf dieser Seite nicht angezeigt werden können. View the total number of search results. You can choose how many portfolios you wish to display at once. Your options are 10, 20, 50, 100 or 500 results. All remaining portfolios can be reached via the pager.